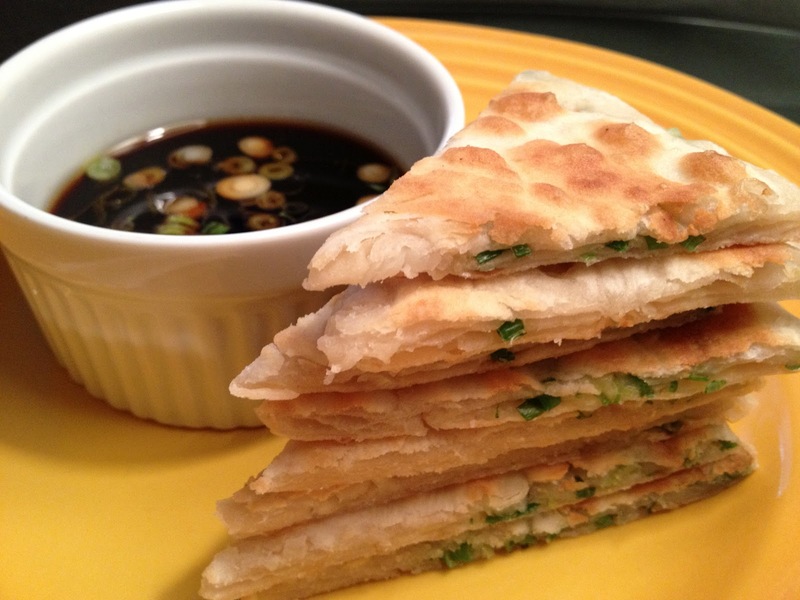 Scallions from CSA Week #5 = scallion pancakes. I did some research and there is clearly one technique which involves rolling the dough into spirals and then rolling it out again. This is the secret to layered flakiness. I looked at these photos (but didn’t follow the recipe.) I also made my own dipping sauce. To make the dough, combine the flour and water, mixing with fingers until absorbed. Knead the dough with a hand mixer fitted with dough hooks for 2 to 3 minutes. The dough should pull away from the sides of the bowl. Cut the dough into 4 pieces. Roll into balls. Pour oil in a little dish. Do this for each one: place the ball on a floured surface and roll into a thin circle. Brush lightly with oil and a sprinkle of salt. Sprinkle the scallions on top. Roll the pancake up (like you were rolling a cigar) then curl the roll around into a spiral (like a cinnamon bun.) Get the scallions as close to the edge as possible (because if they are all bunched in the middle there will be no scallions at what becomes the new middle after you roll and curl. Pinch the end of the roll to keep it together. Press the roll down to flatten it and roll it out to 1/8″ thick. Shake off excess flour. Heat a bit of oil in a non-stick skillet and cook until the dough puckers and becomes golden on the first side. Flip it and cook the other side. Wipe down the pan in between because any excess flour will burn. Using a pizza cutter, slice each one into 8 triangles and dip into the sauce. Enjoy!